Kathryn Hunter was born in New York and brought up in the UK. She trained at the University of Bristol and at RADA. She won an Olivier Award for her role in Complicité's The Visit and was the first female actor to play King Lear professionally. 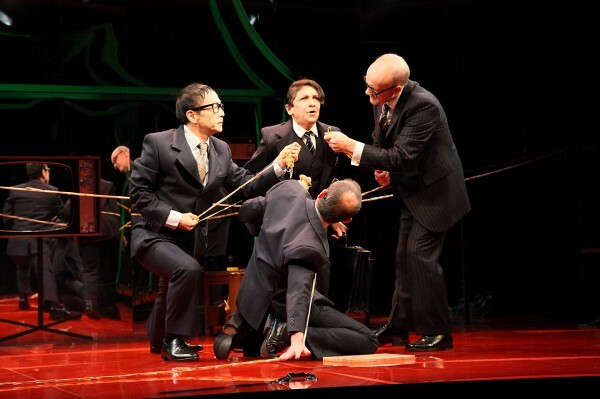 She is an Artistic Associate of the Royal Shakespeare Company and will shortly be reviving her role as a Japanese businessman in The Bee directed by Hideki Noda. Kathryn Hunter, now renowned for her work with Complicité and the Royal Shakespeare Company among others, was not always set on the route to the acting career that has served her so well. Looking back at her first, almost accidental experience of appearing on stage, she describes it as “feeling strange and natural at the same time”. The theatre certainly seems to be Hunter’s natural domain. As well as her work with Complicité, with whom she won an Olivier Award in 1991 for her performance in The Visit, Hunter’s career encompasses work with directors such as Katie Mitchell and Max Stafford-Clark, a stint as Artistic Associate at the Royal Shakespeare Company and a clutch of directing credits to add to her success as an actor. But during her school days, it was Hunter’s best friend who was set on becoming an actor, with Hunter being content to watch her. “I enjoyed watching,” she says. “It was my first experience of directing, perhaps.” While her interest in acting was piqued by her friend’s passion, it was only when someone dropped out of the school play due to illness that Hunter got her first stage role and not until a few years later that she decided on acting as a career. The Bee during its run in New York. Hunter’s enthusiasm for making a story and working as part of a team has continued throughout her training with RADA and her subsequent acting career. As she recounts her journey through companies such as Common Stock and Complicité, the influence of Jerzy Grotowski and Peter Brook and her work with directors like Nancy Meckler and Helena Kaut-Howsen, her career emerges as one of discovery. While she describes the joy of encountering the farces of Alan Ayckbourn, “a brilliant structuralist and master of human comedy”, and how she “discovered Shakespeare’s verse like a fever”, Complicité seems to have been the main scene of Hunter’s theatrical discovery. As she puts it, “a whole new vista of theatre language opened in terms of physical storytelling and spatial awareness”. It was also with Complicité that Hunter took on her first male role, beginning a habit of gender-bending that she would return to at numerous points in her career. She explains that “the company were very free in terms of casting, so it seemed normal and acceptable to swap gender, just an extension of imaginatively getting into any role, whether male or female”.